Ashleigh Galles poses after her interview for the PHEAST program. year. 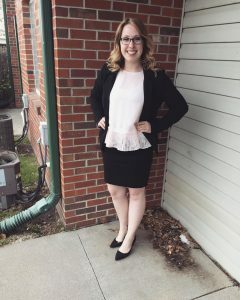 She recently applied and was accepted for The Public Health Early Admissions Student Track (PHEAST), which is a health professions pipeline program designed to recruit, educate, and graduate passionate public health leaders committed to improving population health outcomes in Nebraska. This is a program designed to help guide student’s through their undergraduate degree, and they recieve automatic admission into UNMC. Galles will be pursuing a Master’s degree in Public Health at UNMC in two years when she finishes her undergraduate program at UNK. “Ashleigh came to us highly recomended from faculty at UNK as a Freshman. Her thirst for public health comes through in her work for us, and she has been a great fit for our team,” said Denise Zwiener, executive director of Community Partners.